Once a major chord has been established, a Minor chord is just one step away. Simply take any Major chord, and lower its third one half step. Let's make a Bb Minor chord. Find the notes of the Bb Major chord (Bb, D, and F). Lower the third one half step, turning the D into a Db. Therefore, the notes Bb, Db, and F make up a Bb Minor chord. Let us follow the same procedure again to make an A Minor chord. Find the notes of the A Major chord (A, C#, and E). Lower the third one half step, turning the C# into C (C natural). Therefore, the notes A, C, and E make up an A Minor chord. 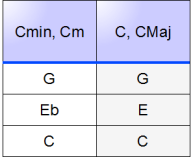 Let us now add to our chart, to show both the Major and Minor chord constructs. Notice that, by simply changing one note, one can form a Minor chord from any Major chord, and vice versa. Also notice that the column representing the Major chord, the basis for all other chords, is shaded for easy identification. The Minor column is placed on the left side of the Major column, to illustrate the "falling" nature of the third of the chord. Here is the same chart as it would appear using a C Chord.